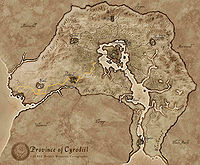 The Gold Road runs east to west between the Imperial City and Anvil, passing through Skingrad and Kvatch. It originally diverged at the Brina Cross north of Anvil to connect to the settlement of Sutch,[UOL 1] but it was taken off the main route sometime in the Third Era after the settlement's abandonment. The Gold Road supposedly continues on to Hammerfell, passing west of the Shrine to Malacath near Sutch.